As I was making my photo collage to include on this very post, my husband caught a glimpse and said "Wow, it's really brave of you to put that out there. You're sure about this?" And my answer? A reluctant "yes". When I go online to find inspiration - the pages I read are the ones that have pictures. Real life, untouched, honest pictures. There is something about making oneself vulnerable that seems to mean business. By posting pics and stats each week there is an extra layer of accountability. I mean, think about it. I WANT to see CHANGE. I don't want to FAIL. And I ESPECIALLY don't want for the people following along to see me crash and burn. I will not be able to hide behind the words and numbers I type on the computer. Doing it this way will keep me motivated. 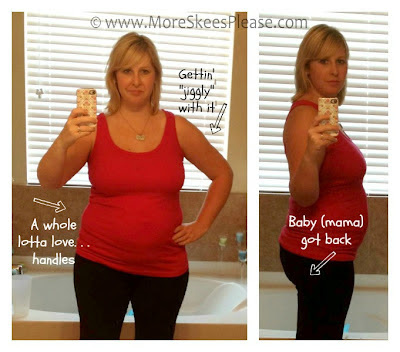 I gained about 38 lbs during my pregnancy. I say "about" because I didn't look at the scale on my last visit the day I went into labor. I've lost about 20 lbs since giving birth - mostly due to #4 below. I am breastfeeding - so my chest is probably not gonna get any smaller until that gig is up. My tummy will never be completely flat. I've ALWAYS had a pooch - even at 112 lbs. in high school. And I had an umbilical hernia repair after having Aiden which really screwed things up in that area. I will not be posting any progress pics in bathing suits like some do. Mostly because I was blessed with the stretch mark gene. Yup, I've got 'em. And they ain't pretty. Alright, here goes! Don't laugh, promise? You are beautiful and you will do great! You don't know me, I worked with Ricky at Samtec but I live your blog. I have a weight loss goal too so thus will help keep me motivated. Good luck to you!!!! Let me just say, lady--you can totally do this. My before pictures (from last year) are worse than yours...and it's the best feeling ever when you reach your goal. You will feel freaking awesome. 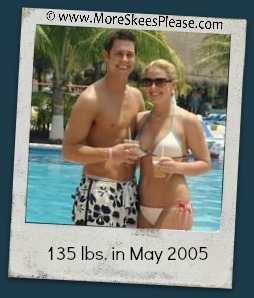 I am on this same journey as you (and this time, starting about where you are weight wise! )....starting Monday :) We can both do this. Sara - Thank you for the boost :) BTW - I checked out your blog and your boys are super cute. Isn't being a boy mom fun?!?! 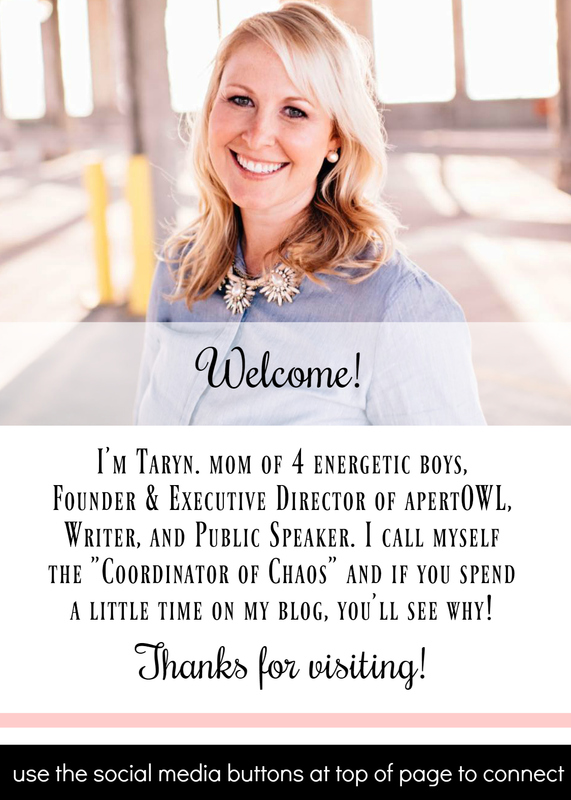 Also, can't wait to dig into your list of blogs you follow in you blogger profile. I'm always looking for new sites to check out and your list seems like a great place to start! Hi Nicki! I'm sure we probably met a few times when I used to bring the boys up to the office. Good luck with your goal! WE CAN do it! Wishing you much success! I'm on a similar (yet WORSE) track, myself. Only my baby is about to turn 20, so... I'm getting started a little late. :) I've already lost some weight, though... about 12 pounds!!! Let's DO this thing! #2: You are such a brave, brave soul. Kudos to you for doing this. Go Taryn. Go Taryn (insert Drew Barrymore, never been kissed patent T dance move) followed by a pants on the ground. Once school starts, I really want to join you in this! Firstly, you have a naturally, healthy, post-preggy tummy. You are beautiful in your own way and those handles can still be melted with exercise and healthy dieting. However, if you think you are ready for it, let me say that liposuction is actually better option than tummy tuck. The former lets you do your activities after the procedure and you need not rest in the hospital for days. Just make sure to choose a renowned surgeon to do it. Meanwhile, tummy tuck hinders you a few days off from work and will require days of hospital stay. You might want to check out online for more information about both procedures. Keep us posted with your exciting adventures in life and may you be guided with your decisions. Good luck!